& Instagram) they are hosting a fun competition with a focus on 'Rhinose Day'. I love the fact that a good cause is getting support in a new and interesting way. 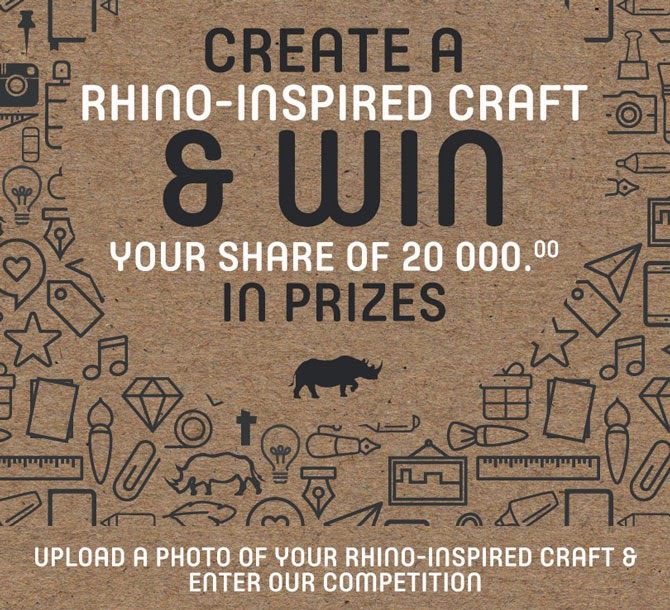 You're invited to submit a rhino-inspired craft to stand a chance of winning more than R20 000 in prizes. The prizes include a R5000 gift voucher and a Samsung Tablet (amongst other things). WOW! The deadline is the 15th October so be sure to get crafty soon. You can share your lovely creations via Facebook and on Instagram using the hash tag #CNACraftComp. But... don't forget to upload your entry here too. I need to do some brainstorming on my submission... I wonder what I can create? To get you inspired and to stock up your craft kit - CNA have very kindly offered a R500 voucher to one lucky reader. Hooray! Wishing you the best of luck and happy crafting! Sometimes Rafflecopter experiences technical difficulties like all modern technology. If you can’t enter for some reason, try again later and it should work. I love the selection in their scrapbooking section, so keen to get my hands on some of those goodies and get crafting! I would buy some craft magazines for inspiration. Being the avid crafter I am, I'd definitely be stocking up on more craft supplies! :) Thanks for the awesome competition! With a 2 year, I'm going to buy loads of colour paper, finger paints, play dough and some googly eyes for some silliness. I would love a new diary for 2015 and magazines, love craft magazines and paper! i would love to buy some crafty books and watercolours for my art projects. Ooooh and some sharpies and liners.